This adorable little pincushion duo is a must have! One stands about 8" tall and sits atop a candlestick or pretty glass bottle and the smaller diva is nested on top of a salt shaker. 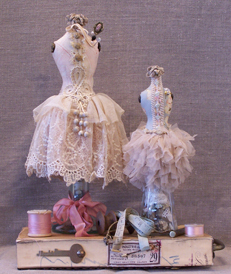 I of course chose to use vintage laces and fabrics but you could go completely modern.